Our condo's laundry room (or more accurately, tiny laundry closet) has been in sad shape for quite a while. We had a giant hole in the wall from when someone came to investigate a leak. We never bothered to fix it since it's so tucked away (you have to walk through my closet in order to get to the door to the laundry closet). Before moving, we just planned to fix the hole and slap on a fresh coat of paint. 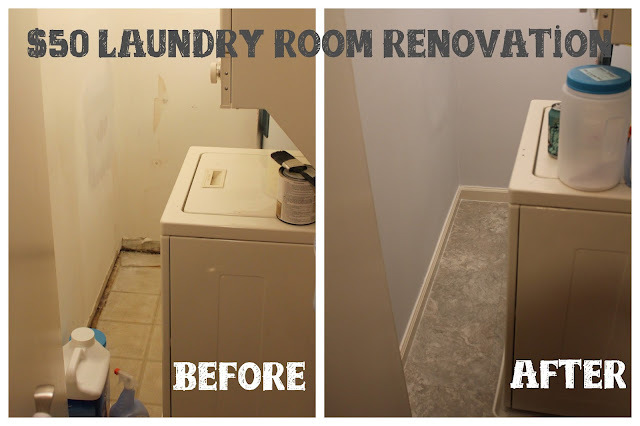 Turns out, it needed a full-blown renovation, but we were able to complete it for about $50 and minimal time, so it worked out for the best! I started getting ready to do the drywall repair, and after clearing out the little shelving unit and junk we had stored back there, I discovered the laundry closet was in worse shape than we thought. The baseboards had rotted out in the corner where that old leak was. Eww! No question - those had to be ripped out. In addition, the floor (which was old & ugly anyway) was also coming up in that corner. You guessed it - we had to fix that too. I was not happy about this discovery initially, but it turned out to be a good thing - very low budget, not that much effort, and a big improvement to the room. First, I started with the drywall. This is the hole that we were dealing with - it was 11" x 14". (And we lived with it for years! What we were thinking?!) The drywall repair was easier than I thought it would be (although admittedly, I did a messy job). The drywall is easy to cut with a utility knife and a straight edge - it breaks right off after you score it. Use joint compound to hold the drywall, then apply drywall tape - I used basic paper tape). Here is where I made my mistake - the taped joint compound should be allowed to dry overnight. Then, apply a second coat of compound over the tape (if you do it when the first layer is still wet, the tape sags and your lines will be visible. Oops). After the second coat is dry, you just need to sand it smooth (and it's much easier to sand than wood). Let's take a look at the state of our walls before the paint, shall we? I knew the walls were stained, but with all the junk we had stored in there, I didn't realize how bad it was. Wowzers, that is just embarrassing. A fresh coat of paint made a world of difference. I painted it the same light-gray-almost-white color that I painted the rest of the place in preparation to rent it out, although it looks darker in here with the lack of natural light. Since we had leftover paint, it was no extra cost! 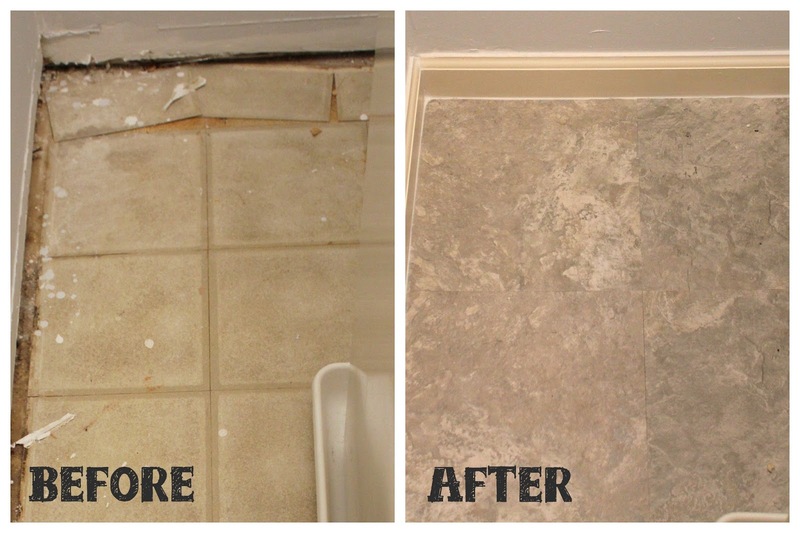 For the floors, I wanted something that would be inexpensive and easy - especially considering the water heater and stacked washer/dryer unit were in the way and I was not about to remove them. Vinyl peel and stick tiles were the perfect solution. I wouldn't consider them for a more visible space, but for this tucked away closet, they were perfect. I bought these - $34 for the case of 45 square feet, which was much more than we needed. They really are like giant, thick stickers - you can cut them with scissors, and to install them you just remove the backing and plop them down. I tiled the whole floor in about an hour after work one evening! I was even able to get them around (and just under the edges) of the water heater and washer, so there's no evidence of my cheater method. So like I said, they're not exactly dream floors, but they make a world of difference for $34 and and hour of labor, don't they?! As my pre-paint picture gave away, I actually ripped out the old baseboards prior to painting. And I didn't take a picture of them either. Those nasty things just had to go ASAP. They came out pretty easily using a combination of a screwdriver and back of a hammer for leverage (we don't have a crowbar) and my hulking strength (or puny arms, whatever). I bought new baseboards at Home Depot for what I think was about $15. Then I got to ride home like this - my junky little convertible from college may not have much space, but it's excellent at transporting weird/tall/long objects! After some sawing, painting, nailing, and caulking, the new baseboards were in, and I no longer felt like creepy crawlies were going to come out from the gaps at the bottom of the wall to get me (yes, I actually had this fear). Sidenote - I hate the yellowish paint color on the baseboards, which is extra noticeable against the bright white caulk. That's the color of all of our trim, doors, etc., and we haven't bothered to change it. Looks like formerly white paint that's yellowed after decades of being in a smoker's house. Uggggly. But at least not rotten anymore! The one thing I'm still contemplating is buying a new washer/dryer unit (which would make the total cost of this reno just slightly over $50...). All of our other appliances were new when we moved in, except for the washer/dryer. It works, but it's old & slow, so I'm on the fence about whether we should shell out the cash for a new one before trying to find renters. In the meantime, the space is looking about a million times better... it may not be winning any design awards, but at least it no longer looks like it should be condemned! Have you done any home updates lately?